The picture was put out on social media for an opinion so we can’t be mad when people give just that: an opinion. People tend to think that gay people cannot raise their children to be heterosexuals. Instead, they have derogatory thoughts of us “tainting” our children or “confusing them” with what society sees deems as wrong an unmanly because we’re gay. But this is all comical because people forget where a lot of gays come from: a heterosexual household. All we should see are two people who love their children and are doing the best to make their lives worthwhile, which is all any parents – of any gender, sexuality, background and color – can do. 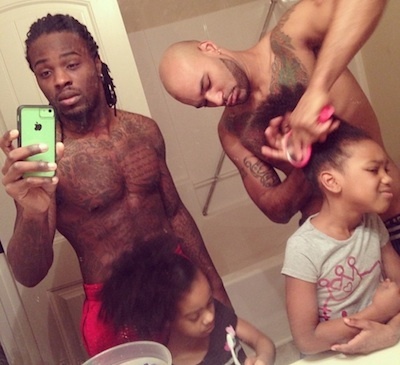 Two dudes taking good care of their kids, raising them with love. Millions of abused and homeless kids around the world would give anything to be in that situation. You just know that half those assholes being rude and disrespectful toward them are terminal f@ck-ups in their own right.